I never thought I might find a sideline as a T-shirt designer. Well, a few months back, I launched the Craft Queer Project, which was a roaring success, I’m happy to say. Not long after that, a friend of mine was telling me about an awesome T-shirt she’d seen a guy wearing. She’d tried to order one for herself online, but the shop was sold out. This was the brilliant Alpacalypse T-shirt from Threadless (which is in stock again, by the way). Now this was at Marchfest, and I’d had a few beers. So maybe I wasn’t thinking straight. Anyway, at the time, I loftily promised to design her very own, custom Alpacalypse T-shirt. The woolly beasts of burden have had enough! They’re out for blood and they’re on the rampage… THROUGH WELLINGTON! The inspiration for this shirt was classic Hollywood monster movies, such as King Kong, The Blob, Creature From The Black Lagoon and also Japanese Kaiju films. This shirt is inspired by classic Sci-Fi, ranging from Star Wars and Forbidden Planet through to Plan 9 From Outer Space. 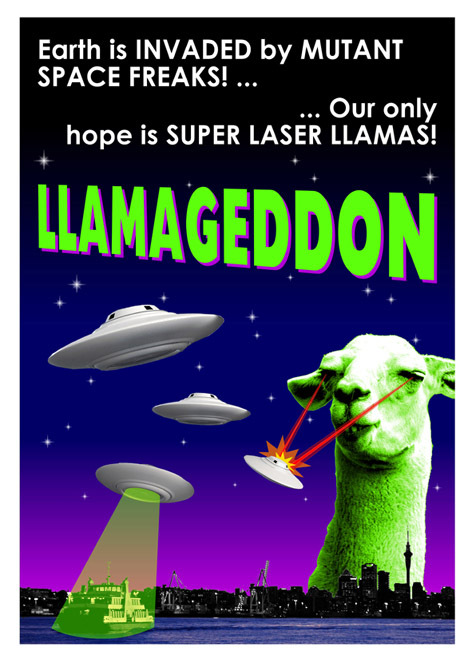 Due to popular demand, Alpacalypse and Llamageddon T-shirts are available from my Print Mighty store. You’ll notice they’re slightly cheaper than the other shirts. I’ve opted to print them on the lower quality cotton to achieve a faster-wearing ‘vintage’ effect. As always, custom pieces are available on request. Bactrian to the Future, anyone? This entry was posted in Custom Clothing, T-Shirts and tagged Alpacalypse, Llamageddon, T-Shirts by Dylan J. Bookmark the permalink.